Aaaaaah…the summer long weekends have started. In Quebec this week, we celebrated St. Jean Baptiste Day, and next week we’ll mark Canada’s birthday on July 1. Across the country people in holiday mode are getting together with family and friends to celebrate outside, often around a barbeque, which is a good thing. There’s something about being in the fresh air enjoying long days in the great outdoors that seems to make people hungry. And there’s something about eating al fresco that makes food taste better. At least that’s the hypothesis that I’ll be testing this long weekend. Outdoor dining can be as simple as throwing a few veggies on the grill although for me, a summer barbeque has to involve meat or fish and nothing seems to please a crowd like a good burger with all the toppings. I’m happy to make my own patties, and there are lots of recipes out there for excellent hamburgers to suit all tastes. But, I don’t have to make my own patties anymore. I have the good fortune to work next door to a team of people who know a lot more about meat than I do. Galerie CO is located just steps away from Lawrence, a fine-dining institution in Montreal’s Mile End that serves up a stellar hamburger at lunchtime accompanied by thick hand-cut fries and homemade mayo that YOU DO NOT WANT TO MISS. But I digress. Just know that chef Marc Cohen presents straight forward wonderfully flavourful food using the best ingredients available. And, lucky for me, his raw burgers are available at Boucherie Lawrence, which is directly next door to Galerie CO. Boucherie Lawrence — the butcher associated with the restaurant and owned by the same team — is a purveyor of fresh, humanely raised, high quality meat from small-scale independent farms in Quebec. It supplies the restaurant and the city with exceptional fodder for carnivores. 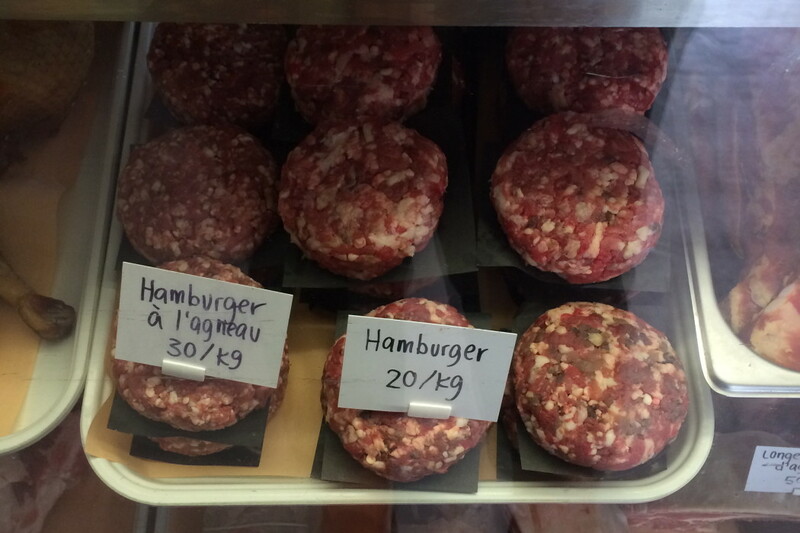 Their burgers start with great meat ground fresh daily and include a healthy ratio of fat and a nice coarse grind. That’s what I’ll be barbequing this long weekend while celebrating Canada Day. And I’ll be doing it in the great outdoors, which means a portable barbeque — charcoal not gas (a bag of charcoal can easily be chucked into the car). Yes, working with a charcoal grill requires some planning and patience, but the payoff is the smokey flavour that comes from the smouldering hot coals. The better the briquettes, the better the smoke; choose charcoal made from real pieces of wood, or mix charcoal with chunks of hardwood. 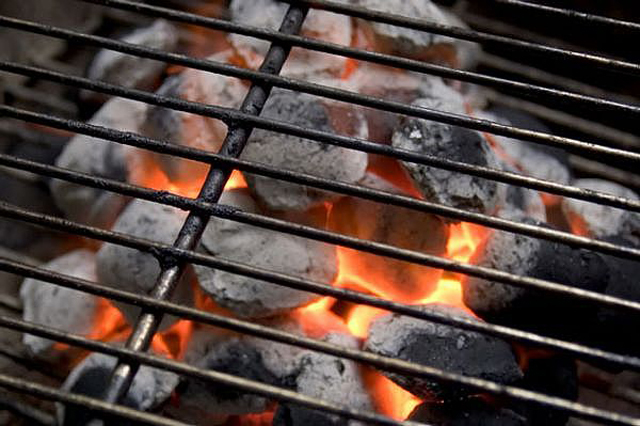 Use enough charcoal to cover the bottom of your grill and get the fire nice and hot. Once the fire is started, there will come a point where the briquettes form a grey ash and the fire is ready. You can redistribute the briquettes, out of their pyramid formation, and place them where you need them for cooking. Whether you buy your patties or make your own, keep them in the fridge or in a cooler until you’re ready to cook them. When the charcoal is ready place the patties on a lightly oiled grill and find a cover, or close the lid. After 4-5 minutes flip the patties, provided they lift easily. Cover, or close the lid and grill for another 4-5 minutes. Flip them one more time and continue grilling until the juices from the burgers run clear and the patties feel solid. Try not to turn the burgers more than once or twice. The more you handle meat while it is cooking, the dryer it will be. And avoid pressing or mashing the burgers into the grill, as this will also dry out the meat and can cause the burgers to fall apart. 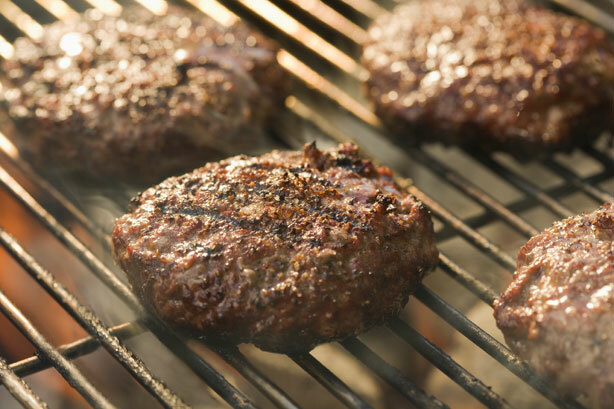 He suggests setting up the grill so that the coals are piled on one side of the charcoal grate to provide a temporary safe haven for burgers engulfed in a flare-up and a spot where burgers can finish cooking without fear of burning, once the perfect sear has been achieved. He stresses that it’s important to close the lid to give the meat the heat it needs to finish cooking. A second trick he shares is to use a small heat-resistant bowl to cover individual burgers where the internal cooking needs to be speeded up, or when cheese needs to be melted. Check before serving, the burgers should not be too pink in the middle. It’s important not to under-cook ground beef. Nothing should be rare. High quality, freshly ground beef can be cooked to medium-rare. Anything else should be medium-well or well done. Once you’re finished with the grill, putting out the fire is as important as starting it. 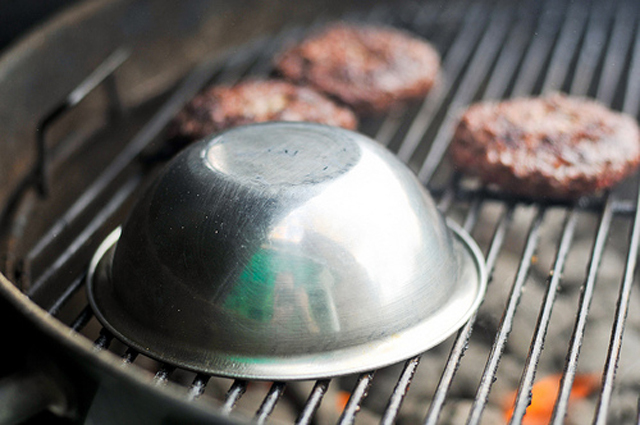 When you’re done cooking, using proper protection for your hand, carefully close any vents on the grill and secure the cover. Assume it will take at least 1 hour for your fire to go out and your grill to cool down. 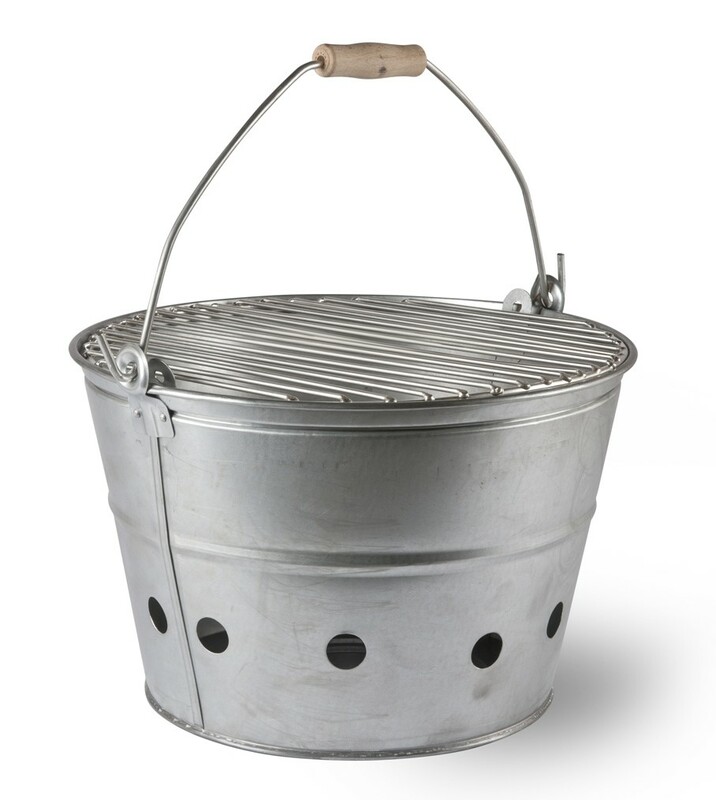 If your charcoal grill doesn’t have a cover, you’ll need to let your fire burn itself out, which could take an hour or two or more. Have fun, be safe and enjoy the holidays. 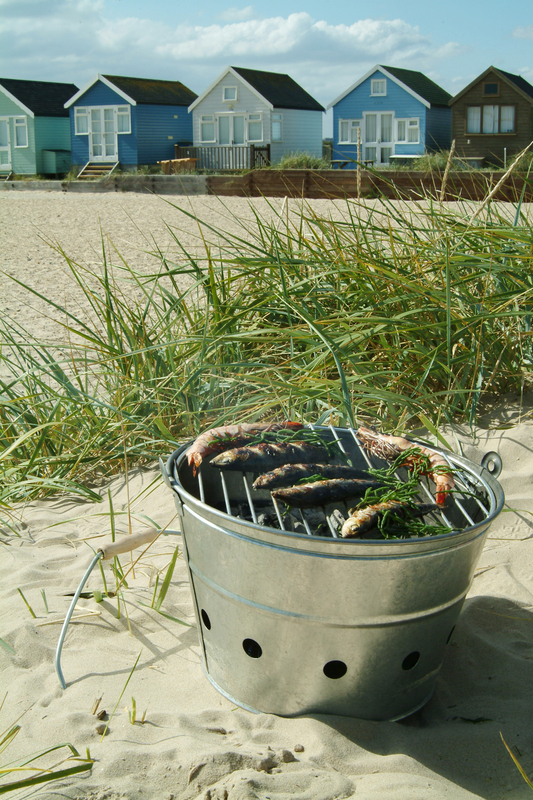 We’d love to hear what you’re barbequing. Let us know in the comments below, on Facebook or on Twitter. June is without a doubt my favourite month. It marks the transition between spring and summer. Fresh growth carpets the city; green, and bursting with life. The sun is bright and the days are long and warm; the nights temperate. But it gets even better: with peonies and Pimm’s. Peonies appear like clockwork at the beginning of the month, starting with the tree peonies followed, for a glorious few weeks, by herbaceous varieties. The quintessential, perennial, peonies have it all going on. 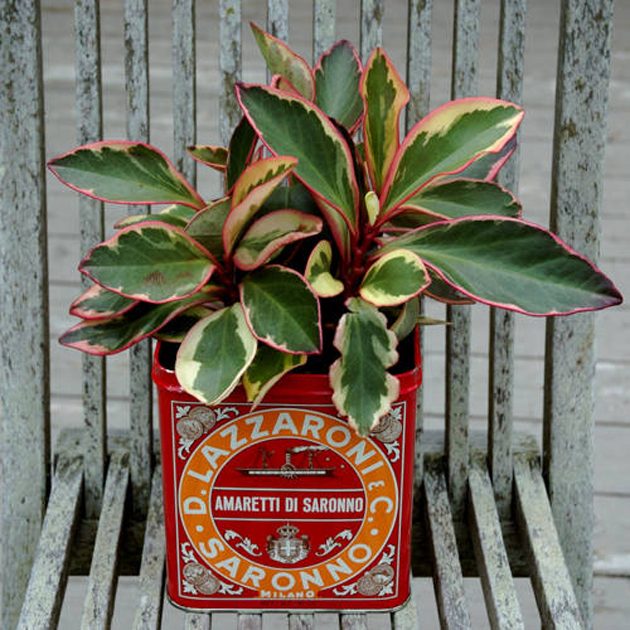 They’re easy to grow, drought-resistant and hardy to zone 3. They’re outrageously beautiful and sweetly fragrant when in bloom. When not in bloom they sport lush green foliage with handsome glossy leaves. And your peony may well live longer than you do. 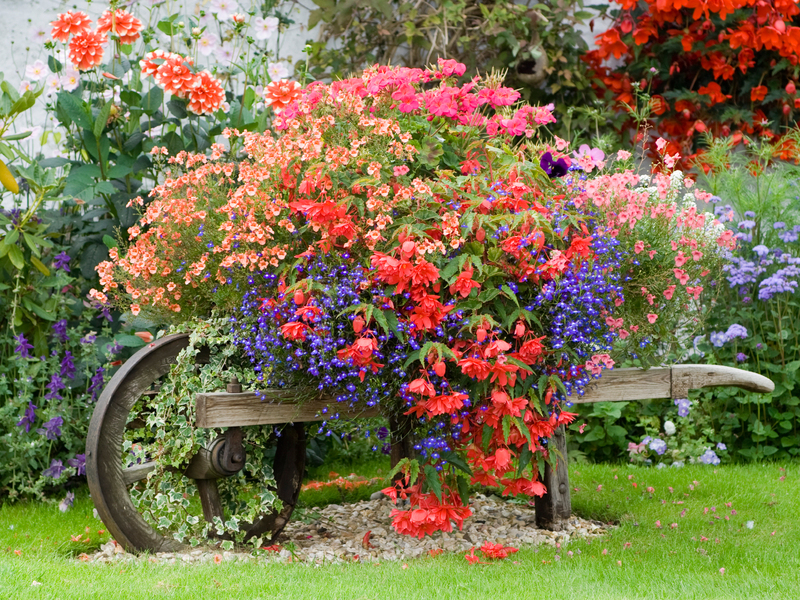 Some varieties have been known to live for 100 years. Peonies have inspired many a writer, and literary references abound. My favorite is that of poet John Keats. In his Ode on Melancholy, Keats wrote of the “wealth of glob’d peonies”— peonies in their final stage of development before they burst open—as a moment when anticipation of the beauty to be revealed by the opening of the bud represents the joy in life, even if it is fleeting. And that’s the thing about peonies. They’re around for a month and then they’re gone. I have peonies in my garden, but never quite enough to harvest them en masse to fill the house for those few precious weeks when they are available. So I buy them. My absolute favourite source for cut peonies in Montreal is a small family-run flower stand at the Atwater market (across from the fish store). Starting in May, and only on Friday, Saturday and Sunday, they will sell you what is in their garden beginning with blossoms, lilacs and lily of the valley – and in June, buckets of peonies going for a song. Even if it’s across town, it’s so well worth the visit if you get excited about the prospect of the early summer’s wealth of fresh local cut flowers! Welcoming in the summer brings me to the second great pleasure I associate with June: Pimm’s. As soon as the weather warms up, Pimm’s becomes my drink of choice. It’s the perfect summer cocktail, made more perfect by the addition of seasonal strawberries, cucumber and mint. Pimm’s originated in 1840 in an Oyster Bar owned by James Pimm in the City of London. He created the Pimm’s ‘House Cup’, later called the No 1 Cup, using gin, quinine and a secret mixture of fruit extracts and herbs to aid digestion. It caused quite a storm at the time, and remains as popular as ever. It’s a staple drink at summer events in the UK, such as Wimbledon where over 80,000 pints are sold every year. I came of age in the UK and cut my drinking chops on shandies (beer and lemonade) and Pimm’s. When I moved to Quebec in the late 1990s, Pimm’s wasn’t available at the SAQ and so I stocked up each summer in Ontario. But things have changed and it’s now widely available throughout North America, including here in Montreal. I urge you to pick up a bottle this summer and mix up a batch of the Original Pimm’s No 1 for your drinking and entertaining pleasure. Fill a jug with ice. Pour over the ice: 1 part Pimm’s No 1 with 3 parts ‘lemonade’ (in Britain ‘lemonade’ refers to a clear carbonated lemonade soft drink that has nothing to do with a home-made lemonade made with real lemons and sugar. British ‘lemonade’ is only available in specialty UK food stores. Good substitutes are Mountain Dew, 7-Up, Sprite or Ginger Ale). Add mint leaves, thin cucumber slices, orange slices and strawberry (you can play around with the fruit accompaniments, but mint and cucumber are essential). It’s so tasty that you will forget it’s actually alcoholic (25% proof). You’ve been warned. It finally feels as though summer has arrived and here in Montreal it’ll be over before you know it. That’s not meant to depress you. The longest day of the year is still two weeks away. It’s just that if you haven’t already planted some flowers on your balcony or in your backyard or started your herb garden for summer recipes, you need to get on it! 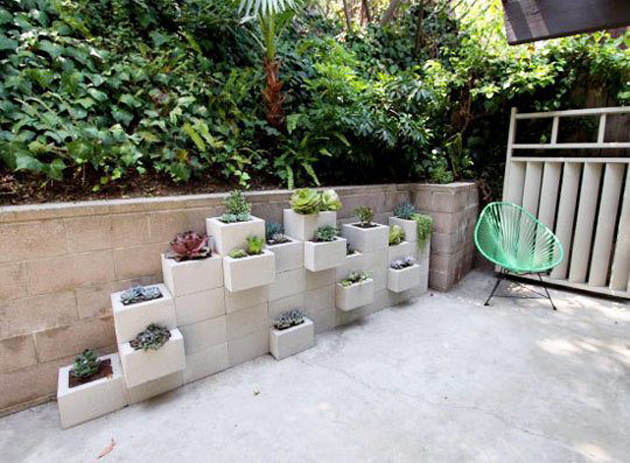 Don’t let the search for the perfect planters become a sticking point. Look around the house or check out your local garage sales and flea markets. You can use and re-use just about anything to grow flowers and herbs; often just as is, or tarted up a little with a paint job. We’ve looked around for some inspiring images of plantings from our neighbourhood and beyond that show what can be done with nothing but a little imagination a few choice plants and perhaps a couple of basic tools. 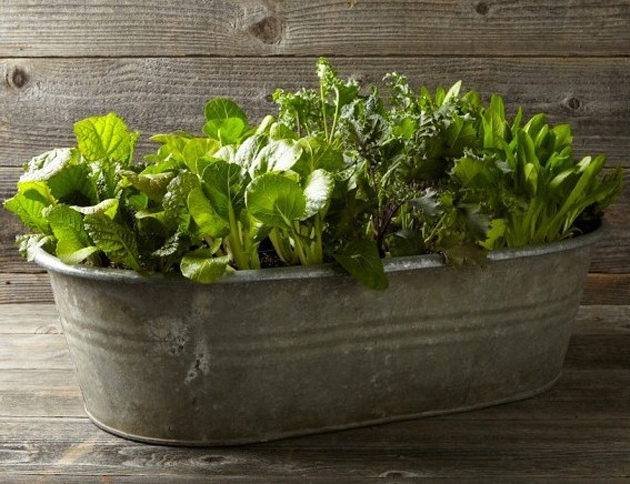 Don’t forget to make sure that there is drainage in your container and pick a vessel that fits not only the size of your space but the size of the plant or plants you want to grow. 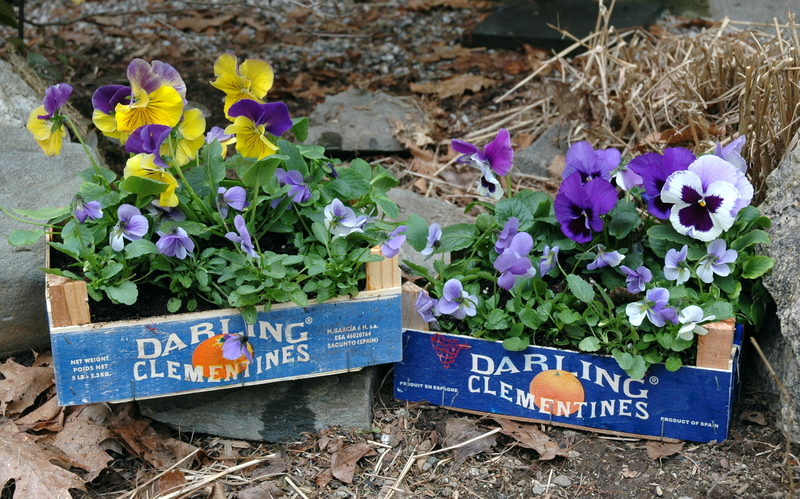 Mismatched and multiple containers arranged in groups can look great. A brightly painted shipping pallet with plastic cups. 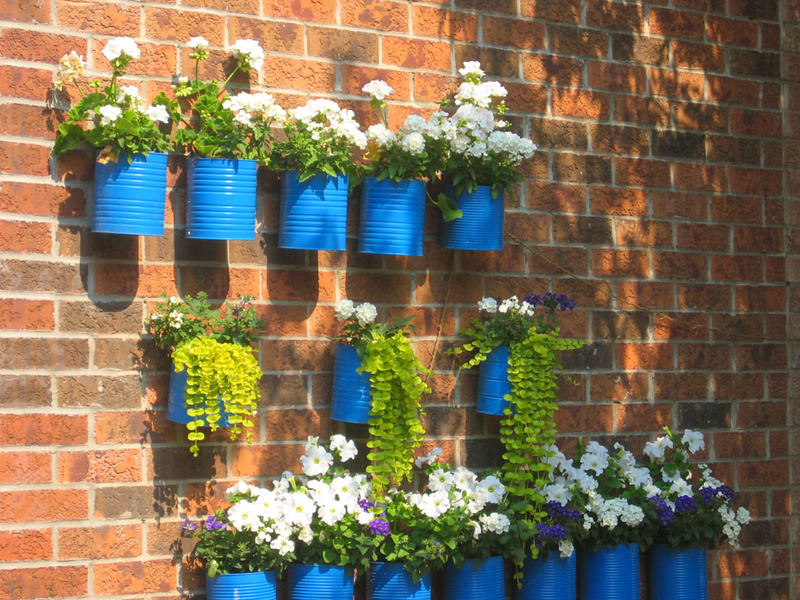 (Source: letsupcycle) You could apply the same principle using terra cotta pots or interesting old cans, such as olive oil containers. Although you’d be hard pressed to make these at home, we love the planters made from truck tires by Tadé, Pays du Levant, which we carry at Galerie CO. They’re modelled on ancient leather vessels, made strong and durable by the hard wearing nature of the rubber combined with the expertise of the traditional craftsmen who make them. However, they’re made in Syria so we can no longer get them due to the civil war in that country. Once our stock is gone, it’s gone. The loss of life and security in Syria is tragic. We feel the impact directly through the merchants and artisans whose livelihoods have been ruined by the conflict and we wish for a just resolution to the conflict so that all Syrians can begin to rebuild their lives. On a lighter note, we’d love to hear from you. 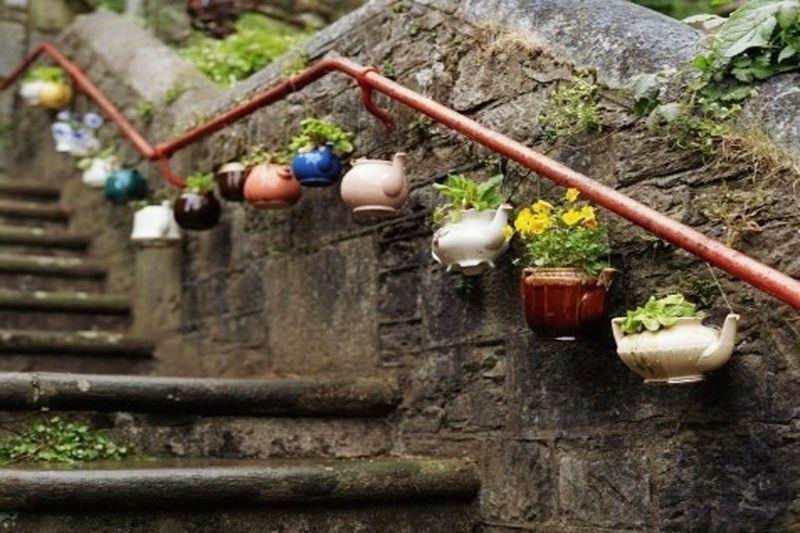 What’ the oddest thing you’ve ever used as a planter? We’d like to introduce you to Joe Jin. He’s a young designer from Toronto and we just started working with him. Joe is also an architect who believes that design should be simple, accessible, intelligent and playful. Here he is, explaining his approach to design in his own words. We fell in love with Joe’s “Mr.” and “Mrs.” pillows, which present the universal symbols for men and for women, re-contextualized. Joe’s pillows are just one of many designs that we admire. In this, our final dispatch from New York Design Week, we want to congratulate Joe for his International Contemporary Furniture Festival (ICFF) Studio Award for his colourful Bent Dot stool. The ICFF Studio is a platform to match selected emerging designers and their prototype products with potential manufacturers. The win meant that Joe was invited to show his stools in New York to the over thirty thousand attendees at the ICFF. Joe Jin’s a busy man – managing interns, meeting with manufacturers, and creating new and innovative designs – but he took some time out to answer our version of the Proust Questionnaire to give Galerie CO fans a better sense of what makes him tick. Joe: We cannot continue to live the way that we currently do. It is not sustainable. Current and future products need to think of sustainability as an integral (and inseparable) part of the design process. Joe: From what I can remember, drawings on the underside of the family coffee table. Joe: There are too many to list. Joe: External weather has less effect on my creativity as “internal weather” (i.e., how I feel). In short, I’m most creative when I am happy. Joe: Thinking about working/designing/creating! Design is a labour of love and as such, always seems to be on my mind. That said, I do love time with friends and family. That, and motorcycles. Joe: Again, too many to list. Joe: Too many to list! If I hadn’t chosen design as a career path, I likely would have trained to be a cook. Joe: Loyalty. Companionship. Similar goals and interests. Joe: Doing what I love (and sharing that experience with loved ones). Repeat. Joe: I’m a foodie, so basing an entire trip on “places to eat” is not uncommon. Joe: Definitely. Here’s a photo of a dish I really indulged in and enjoyed from Le Bernardin. Joe: New York. It’s familiar, and at the same time, it’s not. Joe: Having the opportunity to inspire others to pursue their dreams. Joe: I would be less stubborn. Joe: YOLO (just kidding). I don’t have a motto but this seems to be the only motto people keep saying/tattooing on themselves these days. Joe: “Awesome” (my interns just corroborated this). Joe: Ronel Jordaan’s large felt rock cushion is awesome (we have one in the studio!) and supports a great social cause in South Africa. Joe’s design company looks for opportunities to inject its personality into every component of every product it designs. We like this personality and we’re looking forward to seeing it applied to future designs! For more information on Joe Jin’s pillowcases, click here.